The J D Neuhaus Profi TI range of air operated hoists incorporate many years of design and development, and have successfully proved their versatility and reliability following installations within a wide range of light, medium and heavy duty industrial workplaces. 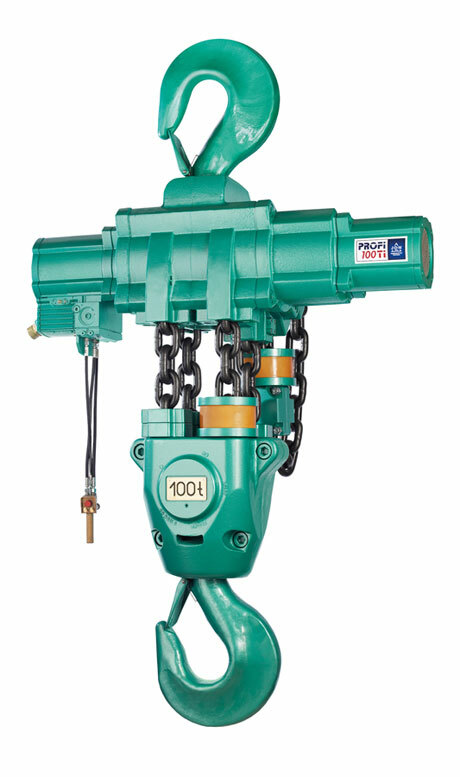 The major aspect of these hoists is that they have been engineered for extremes and can be safely operated even where hazardous working environments exist. Their compressed air supply, utilised for both power and control functions, does not initiate sparks, so providing an unbeatable advantage when hoists are operating in potentially explosive atmospheres. Even greater safety can be achieved by the prevention of sparks generated by static discharges or metal to metal friction contacts. 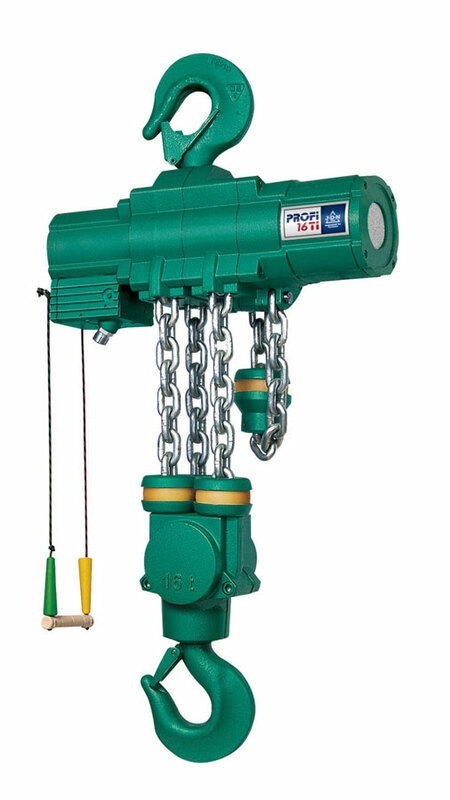 The Profi TI hoist range is the workhorse of the industrial and commercial world, providing lift capacities from 250kg up to a full 100 tonnes. The operating air supply can be set at 4 or 6 bar pressure, with a standard load lift height of three metres being provided throughout. Other optional lift height requirements can also be specified and accommodated as required. All Profi TI hoists are equipped with a top suspension hook, with optional overhead trolleys also available to accommodate lateral movement of suspended loads. Three trolley options incorporate load traverse movements combined with precise load placements. One trolley is manually operated for horizontal movement of the suspended load. A second trolley has a manually operated reel chain mechanism for lateral load movements. The third motorised trolley provides traverse as well as load raise and lower movements utilising compressed air power. All trolley systems can negotiate overhead rail curvatures, and can also be fitted with rack and pinion drives for safe load handling on offshore platforms and sea going vessels. For installations with overhead space constrictions, a low headroom trolley option is also available, suitable for loads up to six tonne. The easy to use range of Profi TI hoists are 100% duty rated with unlimited duty cycles, so minimising any downtime conditions. Their compact modern design eliminates any protruding control hoses or similar external parts susceptible to damage, emphasising the suitability of the Profi range for even horizontal pulling. These standard hoists are also insensitive to atmospheric dust or humidity and withstand working temperatures ranging from ‑20°C to +70°C. Their patented, low maintenance vane motor brake systems ensure fail-safe starting and positive braking, while also being low maintenance as well as suitable for lube-free operation. Various pendant controls can be fitted for sensitive, single speed, multi-function or remote control operation. These design led hoists also provide strong, fast and silent operation combined with high performance, together with more efficiency and greater reliability to ensure high lifting and lowering speeds while incorporating positive sound absorption. The compact hoist designs ensure minimum dead-weight together with suitability for installation in conditions of low headroom availability with loads from one tonne upwards also incorporating overload protection. Hydraulically operated versions of the JDN Profi range can also be made available, together with hoists specifically designated for operation within unique working conditions. These include JDN Profi 25 TI hoists, available with compressed air or hydraulic fluid operation, which are suitable for work undertaken in fully submersed conditions. These subsea hoists provide possibilities of enhanced weightless underwater movements of suspended loads which has included the replacement of a 45 tonne replacement rudder blade for a cargo ship while remaining berthed at sea.